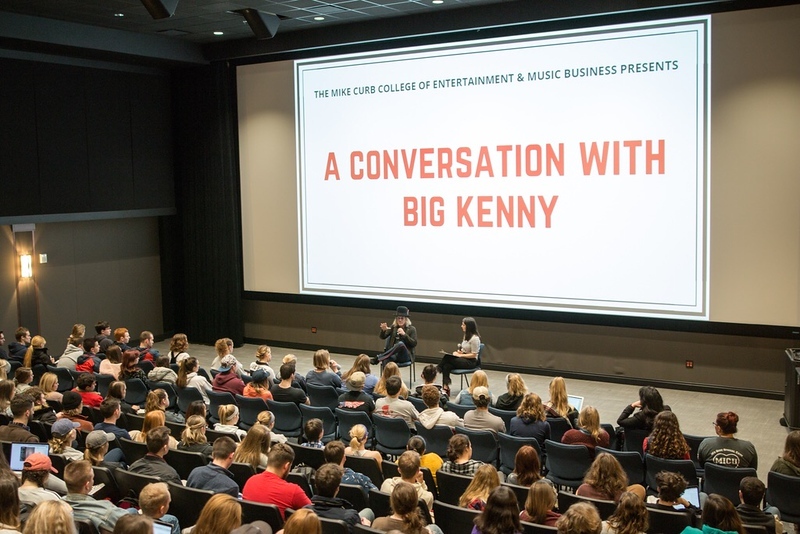 On Friday, January 18, Belmont hosted a convocation featuring Big Kenny of country music duo Big & Rich. Kenny shared his journey to country music and advice for entering the music industry with students. Kenny is a singer, songwriter, producer, musician and humanitarian who has co-written Tim McGraw’s “Last Dollar (Fly Away),” Gretchen Wilson’s “Here for the Party,” and Jason Aldean’s “Hicktown” and “Amarillo Sky.” He also wrote most of Big & Rich’s four studio albums. Kenny shared that his music career began in a small church choir in a farm town in Virginia. He worked in construction and on his family’s farm throughout his early twenties, but soon realized he wanted to pursue a career in music. With a dream and his toolbox in hand, just in case, Kenny packed his bags, locked his house in Virginia and headed to Nashville. Within three months, he had a band together playing a few gigs a week, and within a year, he had a record deal and was on his way to a lifetime music career. Kenny shared that everywhere he went and with everyone he met, he was inspired and blown away by talent. He said that any chance he had to meet someone, get in a door or play some music, he took the opportunity and ran with it. Kenny reminisced on the days of The Music Mafia, a musically artistic group of friends in a music industry alliance. He shared that by getting together at venues to play and write together, these singer/songwriters didn’t have to clean up after themselves and they knew that no matter what happened in their careers, they had each other. Multiple record deals and many concerts later, he met John Rich around the time he was leaving Lonestar, a country music band. By the end of that year, they had written 100 songs together. “Some of the greatest things that happened to me, happened by mistake and propelled me to each step along the way,” he said. Kenny concluded by sharing with students that their minds can get them down or enlighten and open new opportunities. This event was moderated by Kate Cosontino.